The brother of Timberius. Terrigenesis had bestowed Naanis the ability to communicate with machines, a highly esteemed gift among the citizens of Attilan. Naanis’ was assigned to The Royal Guard and served as a protector of the city with high distinction. He was killed in a skirmish with Portuguese mercenaries on the outskirts of Attilan. Following Naanis’ death, his brother, Timberius, lobbied the monarchy and Genetic Council to take action to avenge his brother’s death. Medusa attempted to help quell the escalating tensions with the outside world by citing Inhuman law, specifying that the culpability of this crime should not fall onto all humans, but rather those directly responsible. Timberius took the notion to heart and he later sought out and killed the soldier who had been personally responsible for Naanis’ death. A latent Inhuman whose transformation was caused by way of exposure to the Terrigen Cloud. 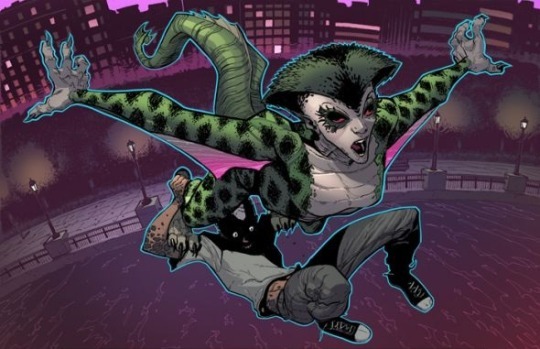 Terrigenesis greatly altered Naja’s physical appearance, changing her into a reptilian form, with green scaled skin, clawed hands and feet, and a web-like membrane connecting from her wrists to her lower trunk that allows for glide-based flight. Along with these physical changes, Naja also gained greatly enhanced dexterity, strength and durability, the aforementioned flight, as well as the capacity to alter the color of her scales so to blend in with her surroundings in a camouflage-style process. Not much has been revealed about Naja’s life and background before to her transformation. While many of her fellow new Inhumans have been very candid about who they are and their lives prior to transformation, Naja has remained elusive on the subject. What has been evident, however, is she appears quite content with the change and happy to have the opportunity to leave her old life behind. Naja’s periodic use of Spanish-language phrases suggests she may be Latina. Hopefully, we will get the opportunity to learn more about Naja’s origins at some point int he future. Shortly after her transformation, Naja sought out Dante and Flint while they were visiting Manhattan. The three tried to enter a nightclub, but the barkeep made disparaging remarks regarding Naja’s physical appearances. Feeling a sense of Inhuman solidarity and distaste over the bartender’s intolerance, Dante told the guy off and the three of them left together. Meanwhile, the former Inhuman despot known as ‘The Unspoken’ had seized control of New Attilan and refused entry to all Inhumans who did not bow to his rule. Dante’s pregnant sister was trapped within the city and he was greatly concerned over her wellbeing. Naja, Dante and Flint chose to invade the citadel in an effort to defeat the Unspoken and save Dante’s sister. Using her gliding abilities, Naja flew Dante and Flint over the Hudson Bay to a tower atop New Attilan. Once inside the city, Naja came to realize that the hue of her scales seemed to change color in accordance to her mood and sense of distress. She discovered that she could make herself ostensibly invisible and she used this newfound power to take out several of The Unspoken’s guards. With the assistance of Medusa and the Inhuman doctor, Vanatos, Naja and the others were ultimately able to defeat The Unspoken and return Medusa to the throne. In thanks, Naja was offered a home on New Attilan and she began training with Gorgon to better utilize her powers. Naja had numerous adventures alongside the Inhumans. She helped to deflect an invasion by the forces of the Ennilux Corporation, defended New York City from the floating city of Aerie, and assisted in quelling a riot in Jersey City caused by Lineage’s tinkering. Following the Secret Wars Event, Naja joined Frank McGee’s mission to search out and recover many of the Inhuman children whose locations has become scattered about the globe as a result of the mass evacuation of Attilan during the city’s fall. Naja then went on to join Crystal’s ambassadorial team aboard the RIV. One of the team’s missions brought the RIV to the nation of Sin-Cong. Leading a stealth incursion squad, Naja discovered that Sin-Cong’s tyrannical leader, The Commissar, had culled all citizens who had been transformed by the Terrigen Cloud, massacring hundreds of people. Naja and her team were forced to intervene and The Commissar was ultimately deposed. Naja has continued moaning her skills under Gorgon’s tutelage while living aboard the RIV. A quick learner, Naja has been Gorgon’s prize pupil and she has assisted him in training other Inhumans skill learning to use their powers. An Inhuman scientist and former junior-ranking member of the Genetic Council. A skilled geneticist, Nadar had collected a sample of all the family houses of Attilan dating back to the age of Randak; a catalog he utilized to assess Inhuman bloodlines so to inform decisions in terms of arranged marriages and procreation. Nadar traveled to Aqua-Base to aid Reed Richards in identifying a trio of mysterious Inhumans The Thing had defeated. Nadar was unable to identify these Inhumans in that they were clones created by Maelstrom and his father, Phaeder. Nadar and Reed Richard then worked to create a chemical compound that had the effect of reversing the mutagenic properties of the Terrigen Mists. This compound was used to reverse the transformations of the so-called Hydromen (a group of civilians who had been abducted by Dr. Hydro and transformed into water-breathing beings by way of a modified version of the Terrigen Mists). The compound that Richards and Nadar created was then stolen by Maelstrom who wished to use it on an attack directed toward Attilan (an attack that, if successful, would undo all Terrigenic alteration among the Inhumans). Black Bolt was able to prevent the attack and Maelstrom was seemingly killed. Nadar has not been seen in a while and his fate following the fall of Attilan during the Infinity Event remains unknown. A member of the younger generation of Inhumans of Old Attilan. The transformative process of Terrigenesis imbued Nahrees with the impressive ability to absorb and manipulate ambient electrical energies. She can take in electricity from the environment, store it and expel it in a range of different capacities. This includes the power to fire bolts of lighting at an opponent, create a deflective force field around herself, as well as an ability for short-range levitational flight. Terrigenesis did not significantly alter Nahrees’ physical form (other than her eyes which regularly pulse with electric energies). This, coupled with the impressive nature of her gifts, led Nahrees to be viewed as greatly fortunate and of high esteem among the society of Attilan… a matter that acted to compound her already arrogant and self-entitled temperament. She was assigned to Gorgon’s training squad for a position with the Royal Guard. Some time later, Nahrees was part of an emissary/student-exchange program meant to enhance relations between Attilan and the United States. It was an odd assignment in that Nahrees very much looked down on regular humans and perceived herself and her fellow Inhumans as the superior race. Nahrees had been romantically involved with her fellow emissary, Jolen, but she ended their relationship shortly after their reassignment to Madison, Wisconsin. Following her break up with Jolen, Nahrees took up with a human student named Damon Hart. Although Damon was quite handsome and popular among his peers, Nahrees remained nonetheless quite embarrassed over her attraction to a regular human and she insisted that they keep their affair a secret. Damon was shot by Mr. Chase, a mercenary hired by a wealthy industrialist named Haller who wanted to capture, dissect, and study the Inhuman emissaries in the hope of finding a cure for his ailing son. Stunned by Damon’s apparent death, Chase was able to incapacitate Nahrees and he brought her to a lab where Haller’s scientists were waiting. The other young Inhumans tracked Nahrees down and saved her with the assistance of agents of the FBI. Although Jolen had killed Mr. Chase in cold blood, the young Inhumans were all let free to go by the federal agents who had arrested Haller and his coconspirators. It turned out that Damon had survived and Nahrees visited him in the hospital were she attempted to break off their relationship. The student exchange/emissary program was ultimately abandoned and Nahrees and her fellow young Inhumans all returned to Attilan. Soon thereafter, Nahrees earned a post as a member of the Royal Guard. Some time later, Nahrees was chosen by Gorgon to participate in an attack on New York City that was meant to intimidate the United States Government into returning a stolen cache of Terrigen Crystals. The mission went awry when Jolen killed several unarmed civilians and Gorgon’s team was apprehended by The Fantastic Four. Nahrees and the others were imprisoned in a facility of the Office of National Emergency. They were all later freed by an escape orchestrated by Dewoz and Malla. Nahrees’ current status and whereabout following the Infinity Event and the fall of Attilan remains unknown. An Inhuman with green skin, black hair and a reptilian-like crest about her neck. Nahar lived on Attilan during the time in which the city-state was located on the blue area of the moon. It was a time of great peace on Attilan and many of the citizens no longer lived in fear of being discovered by the humans of earth. They had grown less reliant on the protection provided by Black Bolt and his royal family and, as a result of this, many had become disillusioned the royals, often giving way to rumors and gossip regarding the relationship between Black Bolt and his queen, Medusa. Nahar bucked this trend and held firm to her loyalty to the monarchy and all that the royal family had done for The Inhumans. She chastised her friends over their lack of faith in their king. This was Nahar’s sole appearance and her current status and whereabout remain unknown. An artist and friend of the young Inhuman, San. Nallo has bronze skin with a series of tattooed markings and thorn-like protrusions about his arms and shoulders, as well as a large set of curling horns about his head. Along with his physical transformation, Terrigenesis had imbued Nallo with the ability to create preternaturally stirring music with his harp. He was well respected and acclaimed on Attilan for the beautiful pieces of music that he could create. Nallo befriended San shortly after San’s own process of Terrigenesis. San had hoped that his transformation would make him a warrior and he was quite distraught that Terrigenesis had left him physically enfeebled, with gifts in no way well-suited for the battlefield. Instead, San gained the ability to manipulate clay into beautiful statues and sculptures. Nallo tried to console San, attempting to convince the youth that inspiring others through his art was just as honorable and necessary for Attilan as being a fierce soldier among the Royal Guard. San remained unconvinced, but his anguish over it all ultimately led to his creating a marvelous piece of sculptural art. Soon thereafter, San was consigned to the emissary/student exchange program that sent him and a number of his fellow Inhumans to earth. Nallo has not shown up since and his current whereabouts and status remains unknown. A mysterious Inhuman whose powers render him completely invisible. Only his shadow can be seen and only then when exposed to light from a particular direction. Nebulo has endured a great deal of training in the art of stealth so that his movements make as little noise as possible. An unscrupulous sort, Nebulo has utilized his powers and training to become a masterful thief, spy, and assassin. He was recruited by Maximus for one of the mad prince’s many schemes to dethrone his brother and take the crown for himself. Maximus’ coop failed and Nebulo and the other coconspirators were banished from Attilan. Maximus and his cronies ended up in the South American country of Costa Salvador where Nebulo assassinated the small nation’s president, assisting Maximus in taking over its government. While in Costa Salvador, Maximus and the other encountered The Incredible Hulk. Maximus was briefly able to coerced the jade giant to join their efforts. The Hulk ultimately turned on them, however, when he realized that their attack against US military forces was endangering Betty Ross. The Hulk assisted Black Bolt in defeating Maximus and his forces; Nebulo and the others were apprehended and imprisoned on Attilan. Nebulo was next seen as part of Maximus’ schemes when he tried to overtake Attilan during the Atlantis Rising event. The plot was ultimately dashed by the intervention of The Fantastic Four and Prince Namor. Once again, Nebulo and the others were forced to flee and it is unknown if Nebulo was apprehended or if he managed to evade capture. Nebulo’s current status and whereabouts remain unrevealed. An especially large Inhuman with gray, rock-like skin, and slightly reptilian features. A member of the younger generation of Inhumans, Terrigenesis endowed Neifi with significantly enhanced strength and durability. Neifi was assigned to the Royal Guard and fought valiantly in repelling a group of mercenary invaders. His current whereabouts following the fall of Attilan during the Infinity Event remains unknown. King Nestor The First. The former ruler of the Inhumans from centuries ago. King Nestor had skin scaled skin and snake-like features. He quelled a caste-based conflict by allowing the winged Inhumans of Aerie to succeed from Attilan. A latent Inhuman who lived in the sovereign nation of Sin-Cong. Exposure toto the Terrigen cloud triggered Thahe Inhuman transformation and he was endowed with power psychic abilities, including the power to exert his consciousness into the astral plain as well as take over the body and will of others. Unfortunately, Thahe and all of the other citizens of Sin-Cong who had gone through Terrigenesis were quickly rounded up and executed by the nation’s tyrannical dictator, the villain known as The Commissar. Although his body died, Thahe’s consciousness managed to live on, trapped int he formless void of the astral plain. When Crystal’s ambassadorial team about The RIV came to Sin-Cong to investigate the mysterious absence of an Inhuman populace, Thahe’s conscious managed to sneak aboard the RIV and discovered Hub, the living dynamo that powered the Inhuman craft. Hub essentially controlled The RIV and in this Thahe devised a means of extracting vengeance on Sin-Cong for killing him and all the other Inhumans The Commissar had executed. Thahe took over Hub and, in turn took over the entire RIV, complete with its vast arsenal of offensive firepower. Through the RIV, Thahe launched an attack on the capitol of Sin-Cong, trigging a massive firefight between the Inhuman vessel and the defensive forces of Sin-Cong. In the end, Swain, the Inhuman captain of The RIV, was able to convince Thahe to release his hold on Hub and the conflict was resolved. Thahe vacated The RIV and instead took residence in the previously comatose body of The Commissar’s father, the previous leader of Sin-Cong. Reanimating this body, Thahe had the new Commissar deposed and imprisoned and took over control of the country. Thahe continues to remain the ruler of Sin-Cong, hiding the fact that he is actually an Inhuman inhabiting and controlling the body of the nations commissar. A latent Inhuman whose transformation was triggered by way of exposure to the Terrigen Cloud. Although her physical appearance did not appear to change, the young woman was bestowed the ability to connect to and manipulate Darkforce Energy. She can use this ability to teleport herself and others over vast distances by way of accessing a portal through the Darkforce Dimension. Nightfall’s connection to the Darkforce also appears to offer her a heightened sense of awareness. Nightfall was recruited by Lash and joined his tribe on Orolan. Lash utilized Nightfall’s teleportation-abilities to transport him all over the world in his continued efforts to recruit new Inhumans and cull off those he deemed unworthy. Unlike many of Lash’s other minions, Nightfall doesn’t appear to fully buy into his views of Inhuman superiority. She helped the New Warriors escape Lash’s clutches and has expressed somewhat laissez faire attitude over the ultimate achievement of Lash’s goals. Although it is a bit of an extrapolation from the actual text, it seems as though Nightfall may possess a very depressed and pessimistic outlook on the world and does not seem to especially care how things eventually turn out. A latent Inhuman whose powers came to him after exposure to the Terrigen Cloud. Nocculus manifested a third eye in the middle of his forehead. Through this eye, Nocculus can exert a type of telepathy that enables him to control the will of others. He additionally has the ability to identify and track other super-powered beings and discern whether to not these beings possess Inhuman genes. Nocculus was recruited by Lash and joined his tribe on Ortolan. Lash utilized Nocculus’ abilities to help him locate new potential recruits among all of the NuHumans created by the Terrigen Cloud. Nocculus’ current status and whereabout remain unrevealed, but it’s a fair assumption that he continues to reside with Lash’s tribe at Orollan. Frank McGee. A latent Inhuman whose transformation was caused by exposure to the Terrigen cloud. Terrigeneis imbued Frank with the ability to release powerful, blinding pulses of light from his eyes. At rest, Frank’s eyes glow with an unnatural yellowish glow. He additionally appears to possess augmented strength and durability. Utilizing the advanced technology of New Attilan, Frank fashioned a set of pistol that fired concentrated beams of light channeled from his eyes.More recently, Frank discovered a new facet of his powers. He realized that releasing the pulse of light enabled him to maintain a photo-realistic memory of what he sees in that moment, complete with the capacity to zoom in on specific details with total resolution and clarity. Frank McGee had formerly been a veteran detective for the New York Police Department. Following his transformation, Frank was forced into early retirement due to the fact that his appearance and new status as an Inhuman had been too unsettling for many of his fellow officers. The transformation also took a drastic toll on Frank’s marriage and his wife left him, unable to cope eerie and constant glow of Frank’s eyes. Seeing so few option available to him, Frank McGee ventured to New Attilan to take up Medusa’s offer of sanctuary for all new Inhumans. He took on a position with the local security division where he was partnered with the Inhuman known as Auran. Quran had previously been officer in the internal security division of Old Attilan. With the loss of so many Inhumans during the fall of Attilan, Auran had found herself quickly promoted to chief of security. Though they came from very different worlds, McGee and Auran found common ground on the similarities of their mutual careers in law enforcement and the two got along quite well. Auarn introduced McGee to her twin daughters, Irelle and Treste. Following a series of successful stings in taking down a counterfeit Terrigen Crystals ring, Auran and Mcgee were summed by Queen Medusa and tasked with seeking out her estranged husband, Black Bolt. Their investigation eventually led McGee and Auran into conflict with Maximus the Mad. Maximus had gained mental control over Black Bolt and he used Black Bolt’s powers to attempt to kill the two investigators. Auran sacrificed her life to protect McGee, leaping in front of the sonic blast and shielding McGee from the attack. Auran perished but McGee survived and, in turn, McGee committed himself to look after Auran’s two daughters as well as complete the task of seeking out Maximus and freeing Black Bolt from his clutches. McGee tracked Maximus to a mountain range in upstate New York. There he was able to distract Maximus long enough for Black Bolt to break free of his brother’s mental control. Once freed, Black Bolt apparently killed his brother. McGee ultimately returned to Attilan where he has continued on as the city’s chief of security and custodian of Auran’s daughters. Shortly thereafter, McGee assisted in repelling an invasion by the forces of the Ennilux Corporation. McGee was eventually promoted to the role chief of internal security of New Attilan.Following the Secret Wars Event, McGee led an investigation into discovering the whereabouts of many of the children of Old Attilan who had been scattered about the globe during the mass evacuation prior to Old Attilan’s destruction. Assisted by Naja and Flint, McGee has been successful in locating and retrieving many of these children. Later, McGee was called on to investigate the theft of a specialized Terrigenesis-negating formula from the halls of The Quiet Room. Assisted by Inferno, Reader and his ward, Treste, McGee was eventually able to track the theft to the villainous Cappo, the former leader of Ennilux who had stolen the formula as part of a plot to regain control over the Corporation. The Cappo managed to escape, yet McGee succeeded in securing the formula and returned it to The Quiet Room in time to avoid a major conflict between Ennilux and New Attilan. McGee has proven a very good guardian to Treste and Irelle. Though they appreciate McGee’s efforts, the two sisters have gone behind his back in and ongoing effort to find a means of bringing back their mother, Auran.